Western Stone Forts is part of the Tentative list of Ireland in order to qualify for inclusion in the World Heritage List. As our last stop on the Irish West Coast, we boarded the ferry to Inishmore. The Aran Islands had gotten raving reviews in Lonely Planet and while I am generally distrustful of Lonely Planet recommendations, the pictures sure look nice. With some excessive driving through Connemara we made it in time for the noon ferry. Staigue which we had seen before on the Ring of Kerry had not impressed me too much. It's a fairly small site. Interesting to see, but putting it into historical context (300-400 CE), you realize how backwards this area really was. Dùn Aonghasa, meanwhile, is just stunning. Situated on a cliff with the Atlantic Ocean just beneath you it is a site to behold and well worth the praise it receives. If you are in the area, e.g. to visit Skellig Michael, you should find time for this. I tried to visit more of the proposed locations, but they were literally impossible to find. I am pretty sure we were within a kilometer of Benagh on the Dingle Peninsula (that's at least where out map puts it), but there were no signs to be found whatsoever and we drove on. If I had only seen Staigue, I would give a rather dubious review. Yeah, a stone fort. I could see inscription chances, but only as a niche nomination. Dùn Aonghasa has a superior, more general quality and I would heavily favor inscription. However, the Irish list hasn't progressed much of late, so I am not holding my breath. In place of the Stone Forts, I could also see an Aran Islands inscription as a unique cultural and natural landscape. See our discussions in the forum. Staigue is a few kilometers off the Ring of Kerry. It is signposted from the main road. Don't drive to fast or you will miss the road. Dùn Aonghasa on Inishmore can be reached by ferry from Rossaveel. A shuttle bus to Galway is included in the ferry ticket. In high season you may have to reserve, but this wasn't an issue for us. On the island you can join a tour by mini bus. We rented bikes instead. There are multiple bike rentals directly at the port. Word of advice: You should manage your time well as the island is rather large, a bit hilly and very windy. The Aran Islands deserve more time than we afforded them. I would have loved to stay a few days longer. Most sites are situated along the Wild Atlantic Way, a great road trip destination with impressive views of Ireland's coast. On the Dingle Peninsula you will find the 7th century Gallarus Oratory and several beehives. There are also several beaches. The largest city of the area, Galway, sees its fair share of tourists, but we weren't all that enthralled by the town and quickly drove on. The UNESCO website is not particularly clear on which sites are incorporated by this proposal. 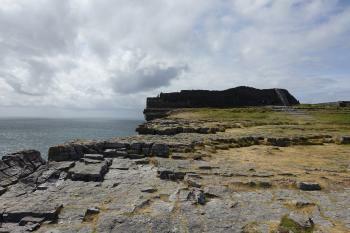 Only Dún Aengus (on the Aran Islands) is specifically mentioned. 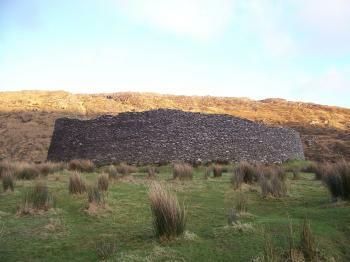 I visited Staigue Fort in Western Kerry in February 2009. It was a great stop on a lovely drive on the Ring of Kerry. The fort itself was small but very impressive, built of thick dry-stone walls and commanded a nice view of the valley down to the Atlantic. It is circular with a very small entrance at the front and a few stone chambers in the wall. The stones inside of the walls have been piled up to create stairs to enable you to get to the top of the walls. I climbed up and was surprised by how big the drop was on the other side; it certainly would have taken a lot of effort to get inside if it was being defended. The fort was a fair way of the main road and I was the only soul here, apart from one sheep. The out of the way charm of the place made it a worthwhile stop. I am not sure if these sites would be put forward as the Irish tentative list is pretty old now and nothing much has happened with it for a long time. They could be an interesting addition, similar in character to the Temples of Malta, though nowhere near as old. From what I can gather Dún Aengus is a very impressive site, but perhaps not strong enough to make it on the list by itself. Putting the western stone forts togther seems like a logical way of making it a more viable candidate for inscription.